The town of Karlovo has 25 715 inhabitants and is 520 metres above sea level. It is situated in the valley of the same name, which is part of the famous Rose Valley, along the two banks of Stara Reka River, left feeder of Stryama River. The town is located 141 km east of Sofia, 58 km north of Plovdiv, 55 km west of Kazanluk, 66 km south of Troyan, 5 km east of Sopot and 17 km west of Kalofer. It is the birthplace of the greatest Bulgarian - The Apostle of Freedom Vassil Levski. History: Karlovo’s remote past is not well explored. The village mounds, remains of Roman roads and constructions that were found in its vicinity can’t be related to certain names and events. Today’s town is a relatively new one. It originated on the right bank of Stara Reka River right after the Ottoman invasion in Bulgaria, as an administrative centre and a residence of the local Turkish Feudal lords, close to the old village of Sushitsa. The village was named Karlovo after the local Turkish feudal lord. The beginning of the 19th century for Karlovo was a time of rapid economic boom, cultural uplift and revolutionary ardour. Hundreds of weaving shops and watermills worked near Stara Reka River. Rich merchants bought what the skilful master coppersmiths, goldsmiths, manufacturers of woollen braids and aba (coarse homespun woollen cloth and upper men’s garment made of it), leather-workers had created and traded with distant countries - Egypt, Albania, Dubrovnik, Romania, Vienna. Karlovo became a big and bustling village with a disctinct centre, town clock and nice houses. The Russian-Turkish War of Liberation put an end to the wealthy life in the town, despite the gained liberty. In 1877 the bashibozouks (Turkish armed volunteers) plundered and set Karlovo on fire. 813 people were slaughtered, most of the survivors ran away through the Balkan Mountains. Fortunately, the surviving parts of Karlovo have kept their original identity. The town is the birthplace of the teacher Botyo Petkov, father of Hristo Botev; Dr. Ivan Bogorov, (writer from the period of Bulgarian National Revival, publisher of the first Bulgarian newspaper Bulgarski Orel (Bulgarian Eagle) in Leipzig in 1846-1847); the brothers Evlogi and Hristo Georgievi (distinguished representatives of the emerging Bulgarian bourgeoisie and patriots, who donated 6 million golden Levs for a Bulgarian institution of higher education - The University), Braiko Hadzhigenov, Hristo Popvassilev and others. Also a native of Karlovo is the famous Bulgarian mountaineer Hristo Prodanov, first to climb a peak higher than 8000 metres - Lhotse (8516 m) and the first Bulgarian to set foot on “The roof of the World” – Mt. Everest (8848 m, 20 April 1984), he remained forever in its frozen embrace. Its greatest fame, however, the town owes to the fact that it’s the hometown of Mother Bulgaria’s greatest son - The Apostle of Bulgarian Freedom - Vassil Ivanov Kunchev - Levski. 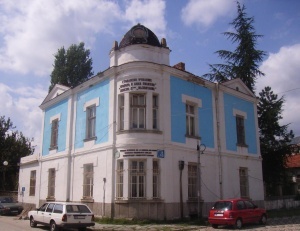 Landmarks: The Town Historical Museum (Bulgarian National Revival and Ethnography, next to the Levski Monument) in house in The Old School- a valuable architectural and historical monument of culture since 1871. Vassil Levski House-Museum. The original house was set on fire during the War of Liberation. The stairs to the cellar and the hideout are all that survived. In 1937 under the initiative of Bulgarian patriots the house was restored. In the yard there is the monument of Levski’s mother - Gina Kouncheva. A spacious exhibition hall has been built, featuring materials and exhibits of the Apostle’s life and revolutionary activities. From this life everyone can learn something - no matter if you’re a Bulgarian or a foreigner, rich or poor, banker or politician. From the humble father’s house to immortality on the gallows, Levski teaches us pure and simple things, shows us the path as nation and humans! The Monument to Vassil Levski (V. Levski Sq., in the old part of the town)- the figure of the Apostle in life-size, on a high base, with a pistol in his hand and a lion next to him. At the lower part of the base there are bas-reliefs. One can always find fresh flowers here, left by ordinary people. The St. Nicola Church (next to Levski’s monument). In the northern part of the yard is the grave of Levski’s mother. The Holy Virgin Church (built in 1847), has a nice stone drinking-fountain near the entrance. The Chitalishte Vassil Levski (reading room and community centre) with a permanent art gallery. The Alexandrovs' (Hadgivalkovs’) House, Beliyat Dvor (The White Yard), Zoevs’ House, Koprinarovs’ House, Patevs’ House, Ploshtakovs’ House, Poulevs’ House (The Union of Bulgarian Artists), Sumnalievs’ House. The bust-monument of Hristo Prodanov is in the town park, in the northern part of Karlovo. Accommodation: Hemus Hotel (3-star). Rosova Dolina Hotel (Rose Valley) (2- star). Besh-Bounar Hotel-Restaurant. Tourist hostel. There are interesting restaurants with original Bulgarian cuisine in Karlovo, Vodopad Tavern (Waterfall), Mazite Tavern, etc. Transport: Karlovo is a large transport centre. It is a main station of the main road and railroad lines Sofia-Karlovo-Bourgas. It provides regular bus lines (public and private) to Plovdiv, Kalofer, Sopot, Pazardzhik and other smaller villages in the area. The Central Bus Station is near the railway station. There are also two private bus agencies: Roza-Express, whose bus station is at Sabota (Saturday) Marketplace and Private Transport Agency, its bus station is opposite the railway station. The railway station is in the southern part of the town. Besides being on the main Sofia-Plovdiv railroad, Karlovo is also the last station of the Plovdiv-Karlovo line. Public bus transport is also functioning. Surrounding areas: The 15-metre-high Karlovski Waterfall (Suchurum) is located 1 km north of the town, at the foot of the Balkan, above the hydroelectric power station - a favourite place of the people of Karlovo for sunbathing during the summer heats. 11 km south of Karlovo, at the village of Banya are the Karlovo baths - a balneotherapy resort of national importance. The mineral water temperature is 35-54°C and its flow is 30 litres per second. It cures diseases of the muscular-skeletal system, gynecological diseases and disturbances of the peripheral nervous system. There is also a mud-cure bed and the mud is used for treatment of various diseases. Besides the resort’s polyclinic there is a sanatorium, recreation facilities, an open-air beach and a lot of villas. There is regular bus transport to Karlovo. About 15 km south-east of Karlovo is the Domlyan Dam near the village of the same name. It is a great place for hiking and camping. There are regular buses from the town. 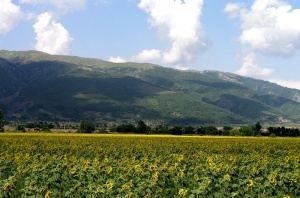 Karlovo is a starting point of tourist routes all over the Central Balkan Range (see Stara Planina related chapter).